It’s here! It’s here! My favorite holiday of the year! I know people get all grumpy about New Year’s Eve because it usually involves an overly expensive dinner or a crowded bar, but that’s why I decided a long time ago to throw my own New Years bash and give all my friends the perfect plan for sending out the year in style and kicking off the new one just right. Call me a sap, but I love the idea of starting the new year with my best friends, doing what I love most: entertaining. It’s also one of my favorite holidays because it involves all things glitter and sparkle and confetti-filled. 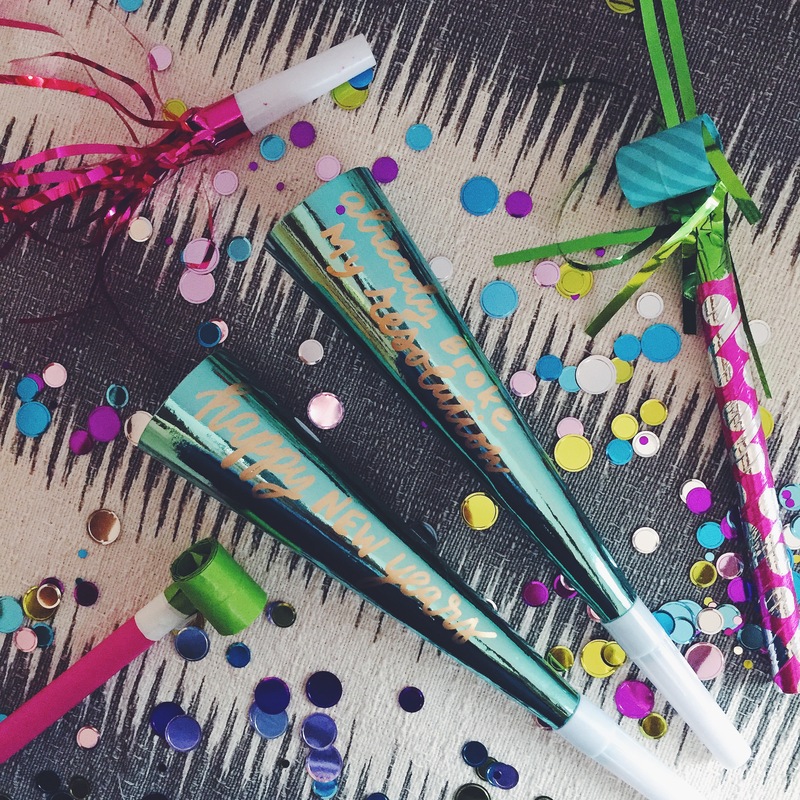 So if you’re hosting your own soiree this year, or need to add a little pop of celebration to a night in watching the ball drop, I’ve got a few last minute DIY ideas you can craft up. I worked on these with Julie of Posh and Prep who lent her expert calligraphy skills to make them a little extra special! One thing I love doing is buying paper party horns and then writing special notes on them, like resolutions or funny quips. 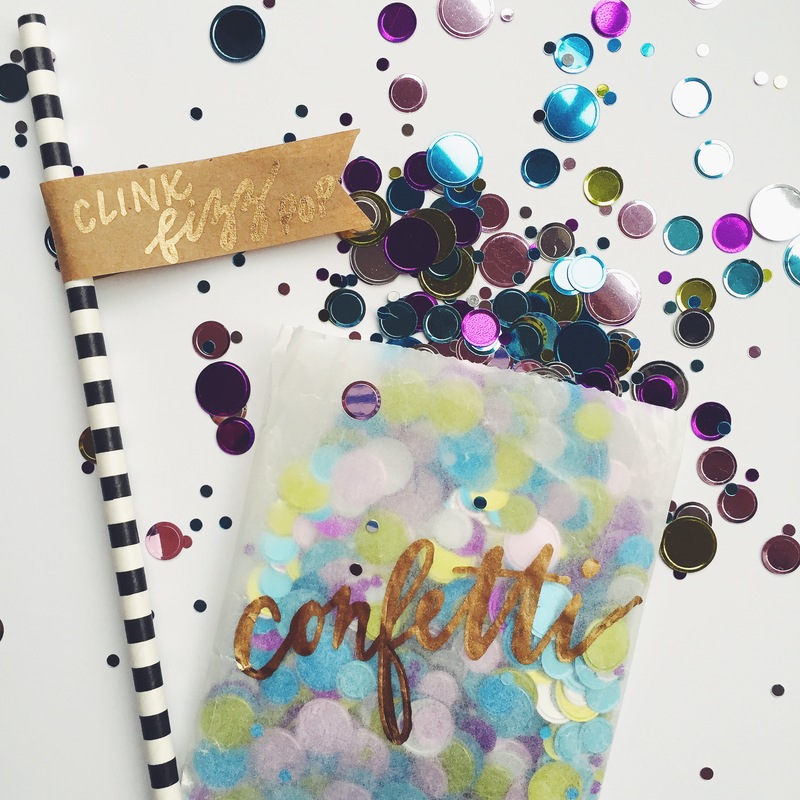 Another easy idea is to fill up small glassine bags with confetti to hand out at midnight (word of the wise: choose a coated or metallic confetti, paper confetti can bleed and stain your floors if mixed with a little bit of spilled champagne — learn from my mistakes people!). And of course adding a little extra sparkle to your bar is a must — Julie made these custom flags for our drink straws, you can make your own with a bit of craft paper, a glue stick, and a gold pen. Write your message and just wrap them around a striped straw and secure with a dot of glue. Hope you enjoy your New Year’s Eve, and I’ll see you in 2016! Cherry-Lime Moscow Mule. Cheers to the New Year.